When Randy Lawrence’s father gave him a 1974-D (for Denver) aluminum penny, along with other coins in a plastic bag more than three decades ago, he had no idea of its rarity or worth. “It’s the rarest coin we’ve ever seen at La Jolla Coin Shop,” owner Michael McConnell explained. After moving from Denver to La Jolla in 2013, Lawrence sold the bag of coins to the La Jolla Coin Shop, completely unaware of its value. In coin collecting circles the penny is called a ‘discovery coin' because it’s so rare, McConnell said. Randy Lawrence’s father, Harry Lawrence, had been a deputy director of the United States Mint in Denver until his retirement in 1979. He died the next year. In the early 1970s copper prices and the U.S. Mint began experimenting with aluminum, among other metals. At the shop, McConnell had the coin inspected and authenticated by the Professional Coin Grading Service. The penny was found to have an estimated value of $250,000. While McConnell and Lawrence planned to auction the coin and give nearly half the money to charity, the U.S. Mint claimed rights to the penny. The Mint cited the fact they never authorized an aluminum one-cent piece to be struck in Denver as proof of ownership. 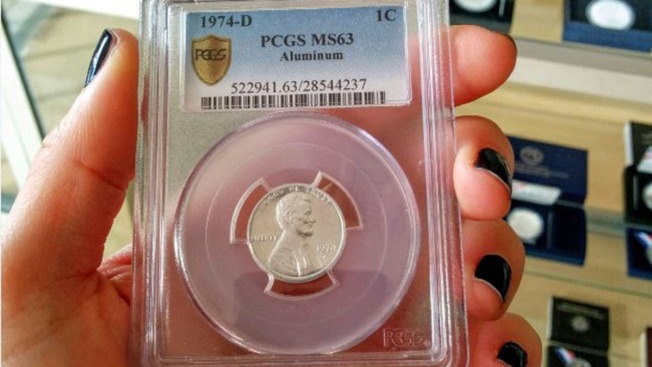 Dr. Alan Goldman, the former interim mint director who served as the head of the aluminum cent project, speculates the 1974-D aluminum penny was most likely part of a very limited unofficial run, and that Lawrence received one of them at some point. "I knew Harry Lawrence very well and he was a straight shooter. He would not have engineered this," Goldman said. "I probably visited the Denver Mint during the 11 years I was there maybe 10 times a year. I'd go to Denver, to San Francisco just to make sure everything was happening there was supposed to be happening." Lawrence and McConnell reached a settlement once they discovered the coin was not part of an official mint production and the penny was the only one known in existence. They will return the coin to the U.S. Mint to be put on display. "I know my father would be pleased that others will get to see and enjoy this rare piece in the U.S. Mint collection for years to come," said Lawrence about his father, who retired from the Mint in 1979.